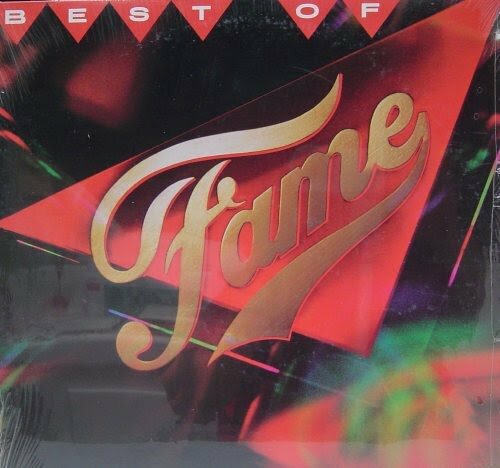 The Best Of Fame album was never officially released in the U.K. which I always thought was very strange after all the success the cast had had with their initial albums this could have been just the thing to spark a new interest in the show and the albums. Simply by adding a couple of unreleased tracks existing fans would have bought it and best of albums always sell quite well in the U.K and attract new people to a product. I mean if they have already gone to the trouble of putting the album together and doing the cover art etc I would have thought it was worth giving it a release to see how it sold and it would have still been a promotional tool for the TV series. So initially I didn’t even know this had been released and it wasn’t until a couple of years later that I discovered it was out when I found an import copy in the Virgin megastore in London. Even though the only track I didn't have at the time was "Rock N Roll World" I had to have the album for my collection. The album cover is quite eye catching but it's a shame there are no cast pictures on the front cover of the album. I do like the cast pictures on the back cover. The album was obviously issued around the time of season 3 being broadcast and features pictures of Billy and Cynthia on the back cover although they don't actually appear on the album. Where as Lori and P.R. who are on "Starmaker" don't have their pictures shown. This album was also later released on CD (In Germany I believe) which was the first of the Fame albums to be released on that format and it is pretty rare. Pretty much all the singles are here "Starmaker", "Hi Fidelity", "Friday Night" live, "Body Language, "Be Your Own Hero" and "Rock n Roll World". Strangely there is no "Mannequin" or "Songs" included which were also released as singles in the U.K.. The other tracks of "We Got The Power", "Life is A Celebration" and "Fame Live" all seem to fit in with the Best Of Theme but I seriously question why "Take That First Step" is included here. If they were looking for a ballad by Valerie then "I Was Only Trying To Help" would have been a far better choice in my opinion. I really like "Rock n Roll World" and for me that was my reason for buying this album as this track had never been officially released either on an album or single in the U.K. Personally I would have also included "Reach For A Dream" on this collection too as that was one of the best songs from the second season and although it was featured as a B side on a single (apart from in the U.K.) it was never officially included on any of the albums, so that would have been a nice extra here. Also Instead of the standard version of “We Got The Power” I would have included the 12 inch mix again as something extra most people would have already got.